Some Dutch residents are outraged after finding out that a few cities have been offering as much as €10,000 to refugees to buy furniture and other necessities, local media reported. Asylum seekers who get allocated to certain towns in the Netherlands may get as much as €10,000 to buy furniture for their homes, according to research carried out by the daily Brabants Dagblad (BD). Talking to the local authorities, Brabants Dagblad found the sum of money varies in different municipalities. While Oisterwijk, South Netherlands offers as much as €10,602 for a family with two children, in other cities, such as Bernheze, Schijndel Veghel and Sint-Michielsgestel the same family may receive around €3,500. Boekel offers the smallest amount of €2,200. The Dutch National Police have taken an interest in Blockchain-based cloud services. A presentation given over the summer reveals a new focus on Storj and Filecoin. Both presentations explain how Mega (Mega Limited) replaced the controversial Megaupload cloud storage service. Megaupload was seized and shut down by the United States Department of Justice in January 2012 over copyright infringement claims. Extradition hearings are currently underway for Megaupload founder Kim DotCom in New Zealand. When the original Megaupload site was seized, federal prosecutors stated, “This action is among the largest criminal copyright cases ever brought by the United States and directly targets the misuse of a public content storage and distribution site to commit and facilitate intellectual property crime.” However, Kim DotCom, founder of Megaupload and Mega, recently distanced himself from Mega, stating over the summer that he would not trust Mega with user data and that he intends to create a third version of the site. “A Boeing 777-200 passenger plane, operating Malaysia Airlines Flight 17, crashed in the Ukraine, east of Donetsk. All 298 on board were killed. Flight MH17 departed the gate at Amsterdam-Schiphol Airport, the Netherlands at 12:14 hours local time, bound for Kuala Lumpur, Malaysia. It was airborne at 12:30 (10:30 UTC) from runway 36C and reached a cruising altitude of FL310 at 12:53 (10:53 UTC). Ninety minutes into the flight, at 12:01 UTC and just prior to entering Ukrainian airspace, the flight climbed to FL330. This altitude was maintained until last contact by ADS-B receivers of flight tracking websites, about 13:21 UTC. Perhaps the best visualization of what the issue is, comes from Vagelis Karmiros who has collated all the recent MH-17 flight paths as tracked by Flightaware and shows that while all ten most recent paths pass safely well south of the Donetsk region, and cross the zone above the Sea of Azov, it was only today’s tragic flight that passed straight overhead Donetsk. ITAR-TASS reported in June that Donetsk defense forces seized BUK missile defence systems from an army unit operating in the region, a point repeated and echoed by NATO Supreme Allied Commander Europe General Philip Breedlove in a Pentagon press briefing on June 30. However, this was directly contradicted on July 18th by Ukrainian Prosecutor-General Vitaly Yarema, who told Ukrainian Pravda that militias do not have access to BUK delivery systems or S-300s. On July 19, Ukrainian intelligence posted what they claim to be intercepted communications showing Russian responsibility for the downing of MH17 along with an English transcript. Numerous alternative media sources claim that the creation timestamp on the video indicates it was created before the crash took place. Ukraine also claims that a post appeared on the social media account of rebel commander Igor Strelkov exactly 35 minutes after the crash appearing to take credit for the downing. Subsequent reporting, however, pointed out that the post was ambiguously worded and the social media account in question may not be run by Strelkov at all. The Ukraine security service also published a video on July 18th purporting to show the actual BUK missile launcher used to bring down the plane being shuttled back across the border from Ukraine to Russia. Despite the fact that there is no confirmation from any source when, where or how this video was taken, or whether it in fact shows a BUK system on a Russian transport vehicle, it has been uncritically reported on in much of the western press. A report originally posted to RT.com shortly after the downing suggested that the real target of the missile might have been President Putin’s plane, which was said to have been scheduled to fly over the exact same airspace as MH17 less than an hour after it was shot down. This claim has since been retracted and RT has noted that Putin has been avoiding Ukrainian airspace altogether since the recent coup took place in Kiev. Some researchers suggest that the timing of the disaster, coming as it does right after Putin heralded the beginning of the long-awaited BRICS Development Bank is more than coincidental. This theory posits that the crash was staged by the US/EU/NATO or other powers as part of a proxy war taking place in the “new cold war” between Russia (one of the key players in an organization that is seen as a key rival to the so-called “Washington Consensus” institutions, the IMF and the World Bank) and the US. Some have suggested that the takedown of MH17 was also related to the six passengers on board who were heading to an AIDS conference in Melbourne hosted by the International AIDS society. The theory holds that the researchers were going to question the origins of AIDS and were taken out in a similar manner to Dr. Jonathan Mann. Yet others point to the numerology of MH17, noting “Flight MH17, a Boeing 777, first flew on 7-17-97 and crashed 17 years later, on 7-17-14.” It has also been linked to a bizarre video of a speech IMF President Christine Lagarde gave at the National Press Club in Washington on January 15, 2014 in which she repeatedly told the audience to pay attention to the “magic number 7″ and made numerological connections to WWI and other events. VIDEO — MH17 engines wrong size for Boeing 777 it is ? Sorry to be so grotesque, but there aren’t a lot of other ways to say it. The Associated Press article floating around the mainstream media in source after source (surely before it gets buried forever) is simply titled, “Rebel Leader Gives Bizarre Account of Plane Crash”. Of course, the commander will be immediately discredited by western-backed establishment media sources simply because of which side of this conflict he politically stands on. Bodies drained of blood and reeking of decomposition at a fresh crash site? Who would even think to make something like that up in the first place? This story is only bizarre until you consider the fact that this situation might be staged. That explanation might help explain what’s going on in this video below, supposedly taken of the crash site moments after the plane went down, where a man scatters a handful of what look like brand new, unscathed passports from the Netherlands on the ground. Again…are they wagging the dog to get us in to wider war? Sure, President Obama seemed all properly concerned today when he mentioned at a press conference that an American was indeed killed on board MH17 and basically advanced the narrative that “Russia did it”. He wasn’t all that concerned yesterday — right after the crash happened — when the media thought perhaps 23 Americans had been killed, however…at least not enough to cancel his burger photo op. Melissa Melton is a writer, researcher, and analyst for The Daily Sheeple, where this first appeared, and a co-creator of Truthstream Media. Wake the flock up! Malaysia Airlines Flight MH17 Lured Into A Death Trap? Christof Lehmann (nsnbc) : Who made the decision that Flight MH17 should fly right above a combat zone when the flight used a more southerly route before? Why did the Ukrainian air traffic controller designate an altitude to flight MH17 that was lower than usual? Why did the Ukrainian authorities close the airspace up to 32,000 ft while the route was declared safe by the ICAO? What are the procedures, who took which decisions, when, and why? 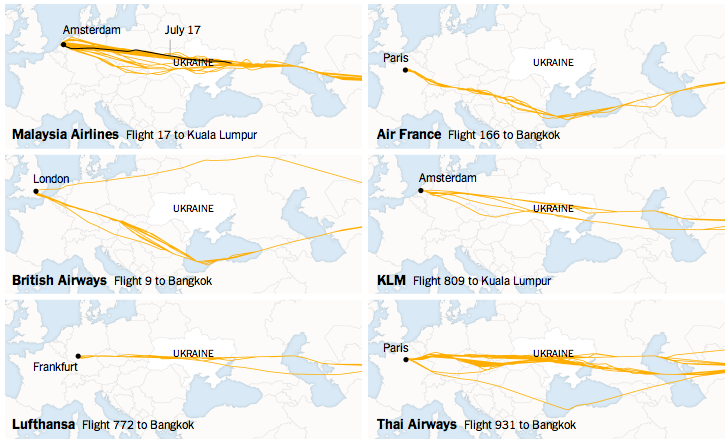 Was Flight MH17 lured into a deathtrap? Was Malaysia Airlines Flight MH17 from Amsterdam to Kuala Lumpur lured into a well-prepared death trap? Eyewitnesses reported that at least one missile hit the plane that disintegrated in flight, strewing wreckage and bodies over an at least 1,000 x 1,000 meter wide crash site. (mid-section only, the size of the debris field is several square kilometers). If the 19-year-old Boeing 777-200 with a reportedly flawless maintenance record was struck by a missile, the event will have left unmistakable forensic evidence. Radar records can be used to determine the flight-path of the missile or the missiles, say experts. The Flight Data Recorder and Cockpit Voice Recorder will tell us more. The plane flew right above the area in Ukraine that has seen the most intense fighting in recent days. “The likelihood that forensic evidence will be found, that supports the hypothesis that a missile brought down MH17 is above 80 percent” said a professional Danish pilot to us on condition of anonymity. “The likelihood that it can be determined where the missile was launched from is 75 percent or above”, he said, adding that “none of my colleagues doubts that there was a missile. The question is who fired it, and who is going to get to play the role of the fall guy”. The International Civil Aviation Organization (ICAO), Eurocontrol and Unanswered Questions. However, an aircraft’s altitude in flight is determined by air traffic control on the ground. Upon entering Ukrainian airspace, MH17 was instructed by Ukrainian air traffic control to fly at 33,000ft. … In April, the International Civil Aviation Organization identified an area over the Crimean peninsula as risky. At no point did MH17 fly into, or request to fly into, this area. At all times, MH17 was in airspace approved by the ICAO. To sum this up. Malaysia Airlines was sure that it was flying through airspace that was approved by the ICAO. When MH17 entered Ukrainian airspace its pilots were reportedly ordered to go to 33,000ft instead of 35,000ft, as requested in the flight plan, which still would be 1,000 ft above the 32,000 ft to which the Ukrainian authorities reportedly had closed the airspace. 1,000 ft; Not much. This poses a number of procedural questions. Since Eurocontrol operates under ICAO rules we called the ICAO in Switzerland. Call one got us to a receptionist and on to an expert who supposedly could answer questions. What we got was an answering machine and a promise to be called back. Call two got us nowhere, because nobody picked up the phone; not even a receptionist. Call three got us through to the same receptionist again who now tried to refer to a press release. Not good enough. A press spokesman? No, not good enough either! An expert? Yes, and please one who can answer procedural questions pertaining MH17! You’ve got it, what was your phone number again? I’ll make sure someone calls you back. The kind receptionist got our number, but we still didn’t get the call which we are waiting for and that, even though our questions are really very simple and should not be difficult to answer for the ICAO experts. Answers to these questions would especially be helpful “before” asking Eurocontrol and the Ukrainian Ministry of Infrastructure additional questions. Here they are, as simple as the get. Which ICAO protocols does Eurocontrol normally follow to assure that it does not designate airspace to planes, that either has been closed by the Ukrainian government or that is dangerously near such closed airspace? Which obligations would the Ukrainian authorities have if they closed an airspace below 32,000 ft? Who exactly would have to communicate what, to whom? Since Eurocontrol and the Ukrainian air traffic controllers, reportedly, designated a flight level only 1,000 ft above reportedly closed airspace; and since MH17 landed in a field, with all of the 298 souls on board killed, possibly due to a missile, I thought that these would be reasonable questions. Questions which should be easy to answer for the ICAO “experts”. Answers to these simple questions would have been helpful before asking Eurocontrol and before asking the Ukrainian government. The Ukrainian Ministry for Infrastructure, Closed Airspace, Changed Flight Levels, Changed Routes. 298 Dead and A Couple of Unanswered Questions. We called the Ukrainian Ministry for Infrastructure to ask if they could get us through to someone who could answer some of our questions for our readers or direct us to someone who could. The first call got us through to a receptionist who registered our phone number, called someone on another line and then tried to connect us to someone who possibly could help. The call was dropped. We called again, no answer. Third time, no answer. The result was the same the other times so we will try again on Monday; maybe we would be more successful if we called from another phone number? The questions we wanted to ask the Ministry were also very simple. Which procedures do Ukrainian authorities follow to assure that Eurocontrol and other authorities are appropriately informed about the closure of airspace. Whether there was someone at the Ministry who could help us identify the authority and provide contact details at that authority that was responsible for changing the routes of flights through Ukrainian airspace. In particular, we would like to know who exactly was responsible for changing the route of MH17 from a path just North of Crimea in the days between July 7 and July 15, to a more northerly route on July 16, and to an even more northerly route, precisely across the airspace, that allegedly had been closed to an altitude lower than 32,000 ft. An area that has seen the most heavy fighting in Ukraine in the days before the tragic crash. We would also like to know whether it is correct that the airspace was closed below 32,000 ft, if yes who closed it and why; Who then, would have reported this closure to Eurocontrol, via which channels? What are the regulations that guide communications between the Ministry of Infrastructure, the Ministry of the Interior which is in command of the National Guard and the ADS forces in Ukraine, and the Ministry of Defense, with regard to the safety of airspace? We will be calling the Ministry of Infrastructure again on Monday. By then, they have probably received our e-mail. We included the screen captures of the flighaware software that documents the changed flightpath, so it should be easy to grasp what it’s all about? We will also call the ICAO again on Monday, because it would be good to know exactly which ICAO procedures Eurocontrol uses or would be supposed to use in a situation as the one that led to the crash of Malaysian Airlines Flight MH17. We will of course also call the Ministry of the Interior and the Ministry of Defense, Eurocontrol, Amsterdam Airport, and others who can help us and our readers answer the question whether MH17 was lured into a trap or not. The truth is usually very simple. It’s first when someone tries to cover it up, that things become complicated. The families of the 298 victims have the right to be told the truth. It’s as simple as that. Editor’s note: nsnbc is an independent newspaper. Please get your free subscription at the bottom of this page. If your subscribe, please consider one monthly donation. Our independence depends, in part, on you. The donate button is in the right-hand column on our website. Update: Passenger Manifest released by Malaysia Airlines. While the world is focused on the questions surrounding the Malaysian flight that crashed in Ukraine on July 17 and the aftermath that will result from it, another campaign of genocide in a long list of campaigns of genocide is taking place in Gaza. After days of both air and sea-based military strikes against Palestinians living Gaza, Israeli tanks have crossed the border and are now pushing even deeper into the tiny sliver of land. According to Israeli military statements, Israel has called up 48,000 reserve troops as well as 18,000 additional soldiers which were called upon on Thursday, July 17. So far, the death toll in Palestine has reached around 260. There has been only fatality on the Israeli side, a soldier who was killed in the northern part of Gaza. Approximately one third of Palestinian casualties are women and children. All of this occurs, of course, in the face of immense apathy on the part of the Western public or even unfortunately amidst fanatical, albeit misguided, support. Yet even the activist communities who would have been focused on drawing attention to the slaughter taking place in Gaza have now been drawn off target as they follow the details of a downed plane in Ukraine, an apparent false flag designed to attract world attention and drum up support for a NATO confrontation with Russia. Clearly, the world oligarchy is not letting a good crisis go to waste. Thus, it is important to remember that, whenever mainstream press outlets begin coverage of a subject that takes on a life of its own – 24 hour a day coverage and constant updates – that, while it may very well be a legitimate issue, it may just as likely be a sleight of hand. The Netanyahu quote is provided by Al-Jazeera. However, the original source, according to Al-Jazeera is the Israeli journal Hotam, November 24, 1989. Brandon Turbeville is an author out of Florence, South Carolina. He has a Bachelor’s Degree from Francis Marion University and is the author of six books, Codex Alimentarius — The End of Health Freedom, 7 Real Conspiracies, Five Sense Solutions and Dispatches From a Dissident, volume 1 and volume 2, and The Road to Damascus: The Anglo-American Assault on Syria. Turbeville has published over 300 articles dealing on a wide variety of subjects including health, economics, government corruption, and civil liberties. Brandon Turbeville’s podcast Truth on The Tracks can be found every Monday night 9 pm EST at UCYTV. He is available for radio and TV interviews. Please contact activistpost (at) gmail.com. Russia and American tensions continue to escalate as Malaysian Airlines Flight MH17 was shot down Thursday in eastern Ukraine along Russia’s border. Without a full investigation, Barack Obama, Hillary Clinton, John McCain and others in the United States government have reached the conclusion Russia was responsible for the deadly attack. Vladimir Putin and Russia deny any involvement, as the mainstream media and the world at large look to assign blame in this horrific situation. Stefan Molyneux decodes the propaganda and presents the facts as they are presently known. 35 Dutch municipalities are asking the government to let them grow cannabis. Dutch laws on marijuana allow people to smoke it legally but a recent global spate of pro-weed legislation is leaving the Dutch lagging behind some other countries. Dozens of mayors and experts from 35 Dutch towns and cities including Amsterdam, Rotterdam and Utrecht gathered last Friday in Utrecht arguing that the current laws, which allow the sale but not the cultivation of marijuana, mean that Dutch coffee shops, which sell the drug, have to get it from illegal gangs, encouraging organized crime and wasting valuable police time. Ahmed Aboutaleb, the mayor of Rotterdam, said that cannabis cafes had to rely on “murky worlds” and that the current situation in Holland was unsustainable, according to the public broadcaster RTV. As a result of the meeting a manifesto addressing the government has been penned. However, the Dutch government disagrees and argues that any change in the law would not be welcomed by neighboring countries, which could see Dutch grown weed in their own backyard. “We agree that crime and nuisance have to be fought, but we disagree on the right instrument,” said Ivo Opstenten, the Security and Justice Minister as cited by The Independent. Utrecht’s alderman for public health, Victor Everhardt who hosted the meeting of mayors has been pushing the proposal since 2011 of the creation of cannabis clubs where the THC content of cannabis plants could be properly regulated, but his suggestion has been rebuffed by the Dutch government. But now the international tide is turning as the world gradually becomes more weed friendly. The United States, which for decades has operated a tough no tolerance approach to drug use branded the “War on Drugs”, has legalized cannabis shops in Colorado with Washington State look set to follow. Colorado now allows the regulated growth of marijuana, which is taxed, for recreational use.While in South America Uruguay became the first nation to fully legalize pot. Since the 1970’s Holland has been one of the few countries in the world where you can have a joint without worrying about getting busted as the possession of small amounts of cannabis has been legal. Dutch cities have become favorite destinations for weed hungry tourists. As a result a so called wietpas policy, which in English translates as ‘weed pass’, came into effect in the Netherland’s three southern most provinces on May 1st 2012. The law was to prevent foreigners from legally purchasing cannabis in coffee shops, but Dutch citizens and expats with residence cards were able to sign up for the ‘weed pass’. The policy proved unpopular with communities in the southern cities where it became law complaining of a rise in the number of street dealers. Many locals also refused to sign up for the pass out of fear that their names would appear on a government list or that their employers may get wind of their recreational habits. The ‘weed pass law’ was due to be introduced nationally on January 1st 2013 but in November 2012 it was repealed. Each city in Holland is now able to regulate the sale of marijuana as they choose. “It’s not like tourists are going to say OK, there’s no cannabis here anymore. Instead they’re just going to try and find it on the streets, leading to a larger black market, more disputes with dealers, no control over its quality and all the other problems we used to have,” said Eberhard van der Laan, Amsterdam’s liberal mayor as quoted by DailyMail. Research from Intraval, an independent agency that carries out social scientific research showed the number of coffee shops decreasing from 1999 to 2011 by 22 percent.